I have to admit to being a major Pinterest addict.. I may need to join a support group, if there is one. 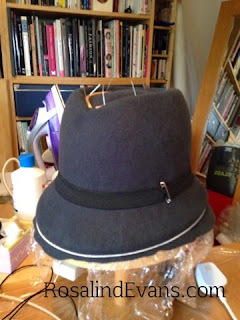 Most of my pins will never get used as anything other than a picture of something that I think is pretty, but some have actually proved amazingly useful and inspired my sewing, hatting and crocheting. One of my favorite finds on Pinterest is Sarah London, a crochet designer from Australia. She has loads of fantastic crochet patterns, some are even free, including a designed for a Granny stitch based scarf called The Arctic Scarf which incorporates all the bold colours that she is most known for. Although I really liked this pattern it was not quite what I wanted, but it is gorgeous nonetheless. So I decided to create my own pattern-eek! 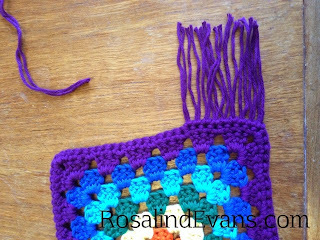 The Granny Square is a classic and super easy crochet technique which I love making, as you don't have the fiddly first step of most crochet patterns of crocheting a long chain and then trying to crochet into that. What I wanted tho was not a square but a long, thin rectangle- ie scarf shaped! This did mean that I needed to start with a long chain-sigh... However, I found a fantastic tutorial (Pinterest again!) on how to make a granny rectangle as the basis for a blanket at the marvelous Crochet Again website. It even has a stitch diagram, which I find much easier to follow than written instructions. So all I needed now was some yarn. 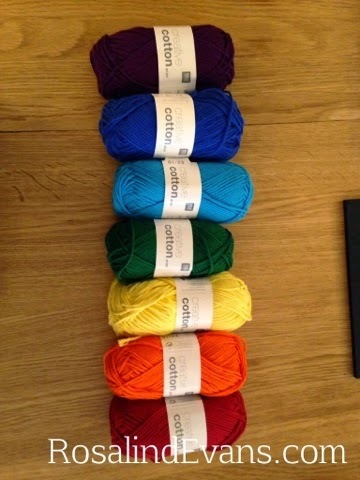 Fortunately for me The Sheep Shop in Cambridge stocks all the colours of Rico's Creative Cotton, an aran weight, 100% cotton yarn, so I could pop in and choose my rainbow. In my opinion it is more of a heavy DK than a proper aran weight, as it feels a lot lighter than any other DK yarn I've used. It comes in so many gorgeous, rich colours, and being 100% cotton it doesn't make my hands itch and go pink when I use it. Anyway, as we all learnt in school the seven colours of the rainbow are Red, Orange, Yellow, Green, Blue, Indigo and Violet (or Richard Of York Gave Battle in Vain!). 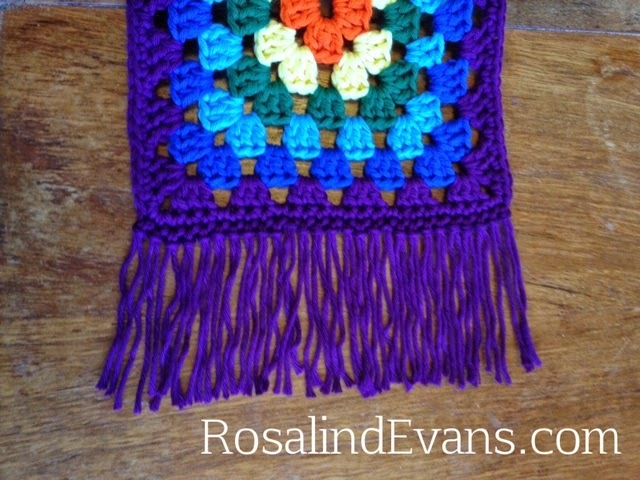 For my scarf you'll need a ball of each colour, plus an extra ball of violet- as the scarf is finished with an extra row of this colour and fringe. 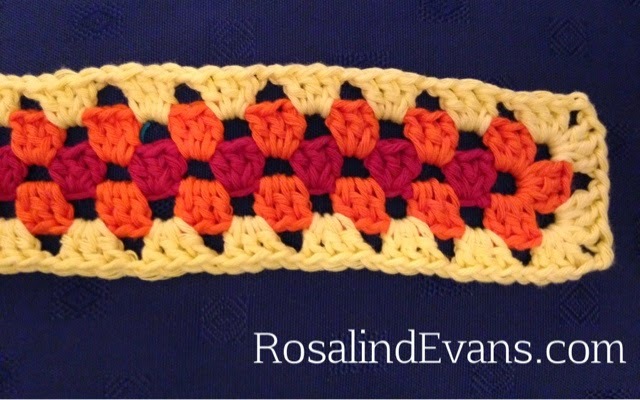 So here is my first crochet pattern! You will need seven colours of Arran weight yarn. If used Rico Creative Cotton in, Red-05, Orange-74, Yellow-63, Green-49, Sky Blue-37, Royal Blue-39, Cardinal-11. The closest I could get to a rainbow. You need one ball of each colour and two of the last colour. Using a 5mm hook and red yarn- Chain 360!!! Yes I know that is ridiculously long, but that's what I wanted. In the 6th chain from the hook 3 Treble crochet (from here on I will call this a Treble group or TrGp). Skip two chain, then TrGp in next chain. 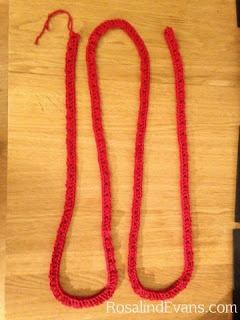 Treble crochet in the last chain. 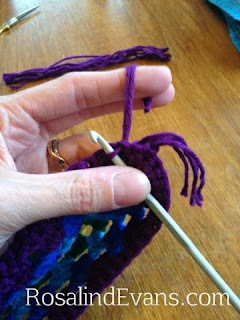 Fasten off red yarn and weave in ends. Begin in a skipped chain space, or between two treble groups, either attach your yarn and chain three (equals one treble) or use the amazing technique called the Standing treble crochet that I learnt at Moogly.com which produces a totally invisible start! (It is called a standing double crochet in American terms). Chain one, then TrGp in next chain space. Repeat (Chain one, TrGp) in each chain space until you reach the end of the red row. Continue making chain one, TrGp repetitions all way along the other side of the red foundation row. When you reach the other end of the scarf work the end in the same was as the first. (TrGp, 3 chain, x 3). Then work along the first side until you reach the starting point. Chain one and work one treble in to the first chain space where you started. Cut the yarn, leaving a 6 inch tail, and pull the tail out from the last stitch. Then using a wool needle, pass the tail under the top loop of the first treble crochet of the row then back through the top of the last treble to create a loop that joins the two trebles. Weave this end in. This produces a seamless join- there are two joins in the picture below-Can see you see them?! Rows 3 (yellow), 4 (Green), 5 (Blue), 6 (indigo), and 7 (Violet), are made exactly the same way as Row 2, they are just slightly bigger. If you'd like a diagram do check out Crochet Again's post mentioned above. Once you've finished all 7 rows, you can block the scarf by pinning it to an ironing board and gently pressing it with a steam iron and a press cloth, or if you prefer you can wet block it- cotton yarn will take either. I then finished mine with a fringe. Fringe is dead easy to make and add to a scarf. I used a postcard to make my fringe, but any piece of card or a cd case or anything that is the twice the length of fringe you want is fine as a template. 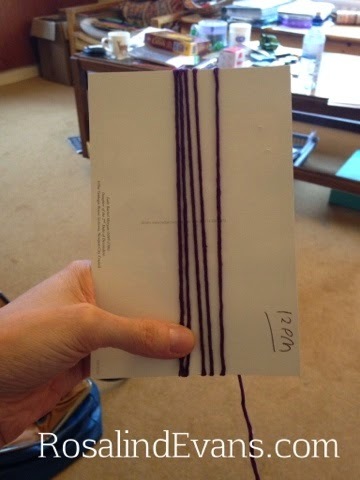 My postcard is 16cm long, so the finished fringe will be 8cm long. 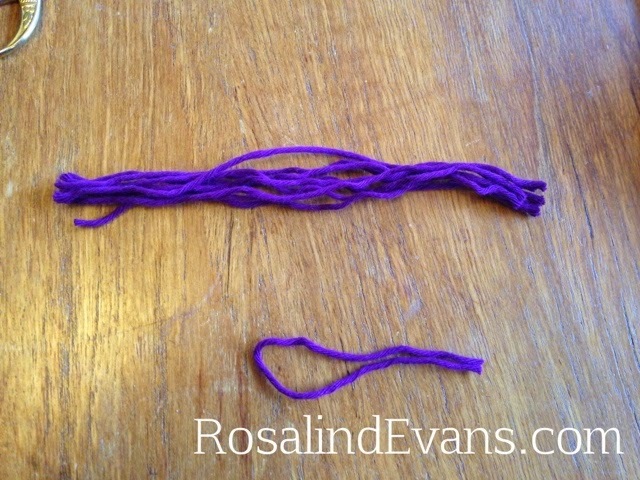 To make the fringe pieces, wrap your yarn around your template a few times- don't do too many wraps or it get more fiddly to hang on to it all. Cut the yarn at the bottom of the template, keeping hold of the yarn on the template, then cut it again at the top of the template. This will leave you with several individual lengths of 16cm. 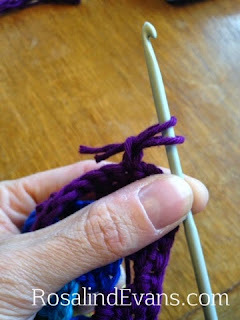 Pull the ends gently to tighten the knot against the scarf. Repeat this process all the way along the end of the scarf. You may need to trim the ends of the fringe a little to get them completely level. Now, take your scarf wrap it several times around your neck and feel smug! I hope the pattern is clear and easy to follow, any problems do drop me a line or a comment and I will try and help. 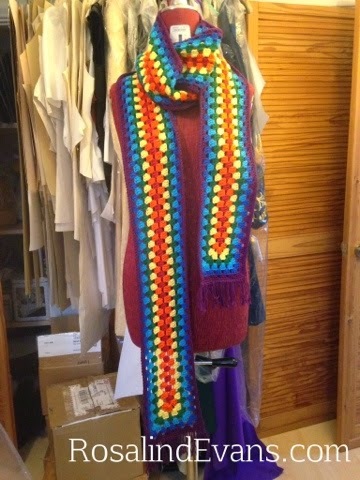 Pattern Rainbow Granny Scarf, Copyright Rosalind Evans. You are welcome to reproduce this pattern for personal use, but please do not use it for commercial gain. Please do not reproduce my photos or the text of this pattern without contacting me first. 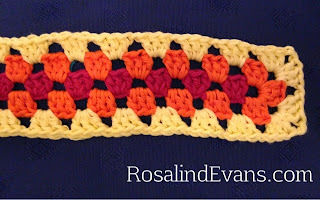 If you would like to link to this pattern please do, but I would ask that you let me know. You can see the brim block that I used in the background. So, now I'm finally feeling a bit better and have some time, it was at last time to try my new block out. 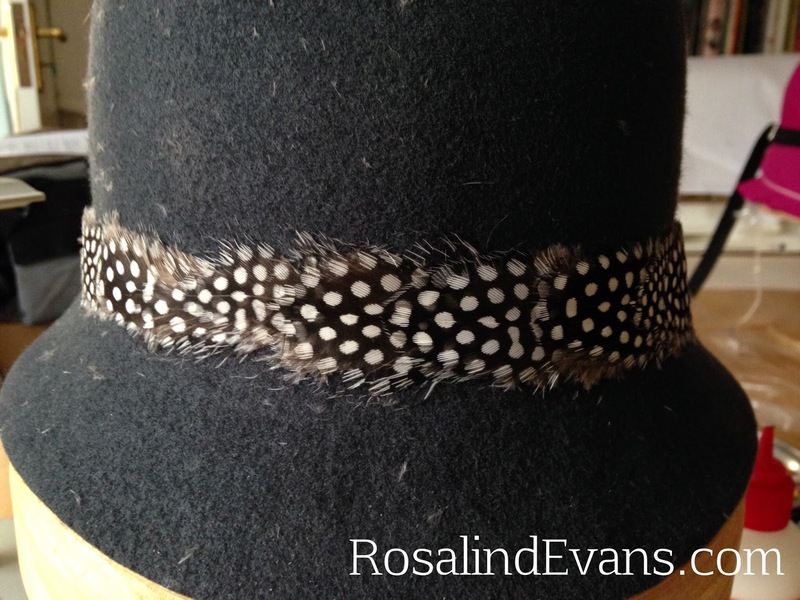 It has also been ages since I have done any feather work, so I decided that I would do a feather hat band on my new shape, as it would not distract too much from the nice shape of the crown. 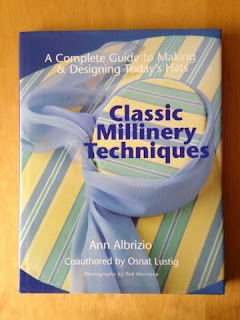 I've learnt a lot about using feathers in millinery from one of the first millinery books I ever bought- Classic Millinery Techniques by Ann Albruzio. 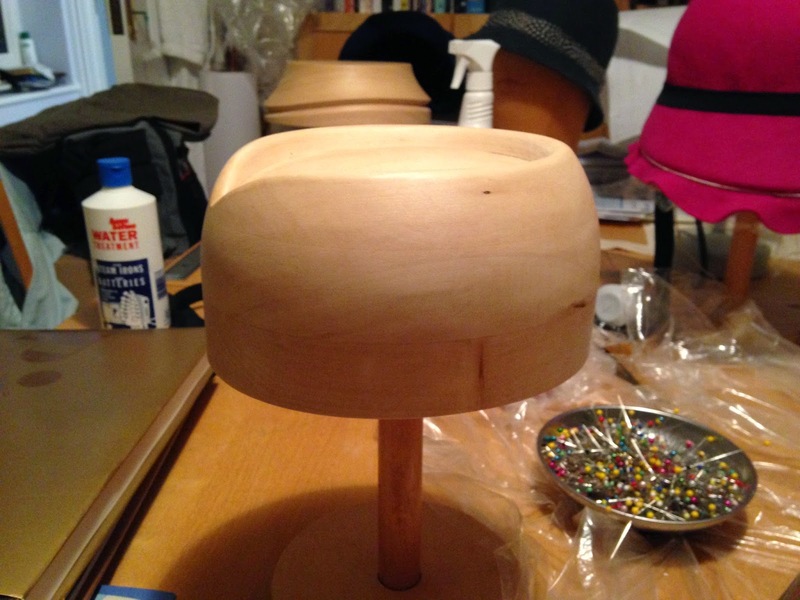 The detail in the crown top is held in place by a piece of blocking reed and pins, the bottom of the brim is created with a finger groove and string. 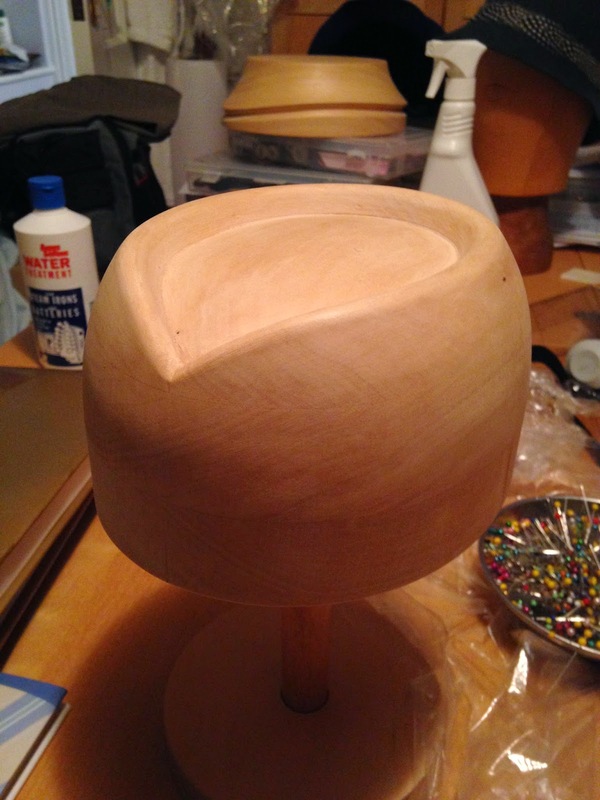 I really like having a finger grove at the bottom of a brim shape as it makes it so easy to get a really smooth clean brim line. Once the felt had dried, I used size to stiffen the crown and hold in the shape and trimmed the excess felt off the bottom of the brim. I replaced the hat on the block to make gluing the feathers to it easier, as having the block to press against gives you a stronger bond. To keep the hat band straight and level I marked the line I wanted with chalk and my hem marker. The first thing to do when adding feathers to a hat is create a 'lift'. This is basically a long, thin piece of paper folded in half and pinned to the hat at the centre back, as you can see above. 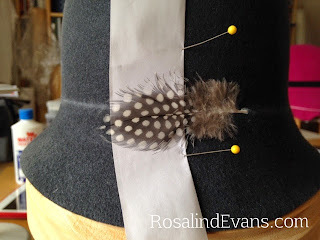 You can then glue the first feather to the hat over lapping the lift. 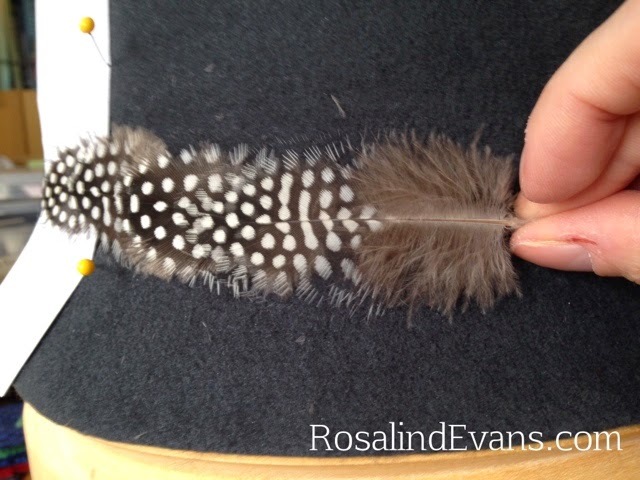 Before attaching the feathers its best to hold it in place first to check how it will look (see below), and then trim some of the fluff from the bottom of the feather. Don't remove it all as it will give the next feather a bit more volume, but you can trim the fluff down so it won't show through the next feather, or poke out from the top or bottom of the band. You should also remove about a cm of the fluff from the quill of the bottom of the feather, so you can glue the quill really securely to the hat.. You can cut it off with scissors but the easiest way is just to grip the fluff in one hand close to the quill and hold the quill with the other, then just pull the fluff away with a quick downward movement. The lift is then left pinned in place as you work around the hat, feather by feather. Because feathers are not man made they will all be a bit different, so don't expect every single one to line up perfectly or the hat band to be the exact same width all the way round. What you are aiming for is as smooth an overlap as possible and trying to keep the band the same width as much as possible. 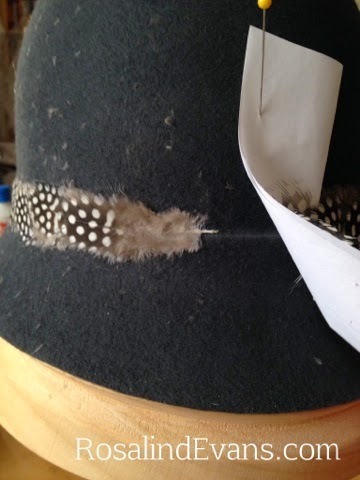 Once you've worked your way around the hat towards the CB you can use the lift to raise the first feathers up, which allows you to then glue the last feathers underneath them and create an invisible join. The lift holding the first feathers out of the way. Can you see the join!? As you can see, feather work gets very messy! It doesn't matter how careful you are, the stray fluff will get everywhere and stick to everything... The best way I have found of tidying it away is to use a piece of sticky tape to catch it on, then fold it up and throw it away, I've even been known to put the tape in a bag and then throw it away. However, I guarantee you'll still find bits of fluff for the next few days, especially on your socks! Another good tool to have on hand when using feathers is a toothbrush. Its very useful for brushing small areas of the felt and also giving the feathers a light comb once they are glued on. I'm hoping to get a lot of wear out of this design as it should go with everything, the next hat will be a bit more flamboyant!